Yasodhara Yoga is a reflective, spiritual approach to yoga that integrates body, mind and speech. By integrating yogic practices with personal development techniques, Yasodhara Yoga encompasses the teachings of the East and translates them for our Western situation. Yasodhara Yoga practices will help guide you to your own inner wisdom. The spiritual goal of yoga is self-realization through exploring the question, “Who am I?” In Yasodhara Yoga classes, students create a personal learning experience using practices to help build a foundation for the inner work necessary on the path of yoga. Yasodhara Yoga Teachers and Centres offer classes in Hatha Yoga, Hidden Language Hatha Yoga, Dream Yoga and Kundalini Yoga. Other Yasodhara Yoga practices such as mantra and reflection are included in the classes. 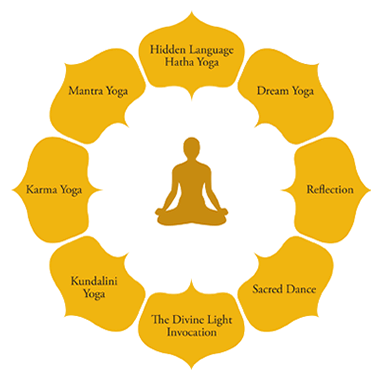 Hatha Yoga integrates classical asanas with spiritual practices of mantra and meditation. Offered in small groups, these classes empower students to accept and listen to their bodies. Non-competitive and compassionate, open to all levels. This gentle and meditative style of Hatha takes the asanas far beyond a series of physical exercises and respects the body as a spiritual tool. Hidden Language starts with the very personal – your observations, your mind, your body, your relationship to the world. And it expands out to the universal, to the mythologies of our cultures, to the subtle force sustaining all life. The asanas are practiced not only for their physical benefits, but also to understand the psychological and symbolic meanings, to learn how each asana can increase spiritual awareness. For those accustomed to physically intense or rigorous Hatha traditions, Hidden Language will be a change of pace, a chance to go deeper into the body and the mystical potential of each asana. The atmosphere of a class is quiet and self-directed. The teacher offers principles – such as spinal awareness, moving with the breath, relaxing in the movements, and observing physical, mental and emotional responses – but you are given responsibility for your own self and your own insights. Students take time between asanas to write down observations. At the end of class there is a deep relaxation, then the class gathers together to share their reflections. Kundalini Yoga is the path to freedom, a practical and powerful tool for self-development. Swami Radha has developed an approach that takes the wisdom of this ancient system and makes it accessible to daily life. In Kundalini Yoga, you investigate your own mind and consciousness. By asking important questions, studying the symbolism of the chakras and practicing reflection and meditation exercises, you begin an exploration of consciousness and build the foundation for character, courage and awareness in your life. Dream Yoga is a way to get in touch with your Higher Self through the involvement and analysis of your dreams. Analyzing the content of dreams is the most direct means of learning to understand your self. By combining yoga techniques and practices with an investigation of symbolism, Dream Yoga opens up a dialogue with the unconscious mind. It is a detailed method of interpreting the messages of your subconscious to create change in your waking life. The yogic method of working with dreams emphasizes independence and stresses understanding yourself as an individual. Dreams are personal creations, and as you study them you learn the language of your unconscious. Making your own discoveries is a very joyful process and gives you the courage to go on. By finding answers within, you gain self-confidence. Reflection (written self-reflection and journaling) is an important yogic tool in our tradition, a tool to access the inner self and inner learning. Writing down your experiences helps you train the mind to concentrate and observe, and it creates a record of your own personal wisdom. In classes we reflect to capture a moment of insight or to delve deeply into a question that arises. We explore language and symbolism in a Hatha Yoga asana. We ask ourselves questions and record answers, ideas, concerns. Our journals become storehouses of personal knowledge. Karma Yoga is the practice of selfless service, also know as the yoga of action. Karma Yoga is explained in the Bhagavad Gita as the performance of one’s duty without thought of reward or punishment. This means doing the work that needs to be done simply because it needs to be done, putting high quality into your efforts and expecting nothing in return. Karma Yoga is a powerful practice for liberation, transforming attachments and attitudes, a way to deepen your understanding about yourself and others. Using the yoga of action, we can take the theoretical learnings of yoga and test them out in our daily lives. It is the spirit with which we approach our work that transforms our actions into the practice of Karma Yoga. Karma Yoga is marked by willingness, care, consideration and cooperation. By spiritualizing our work, we can lift any task from the menial to the meaningful. It is an intrinsic facet on our path of spiritual development and a tool for self-reflection. The Divine Light Invocation is a standing meditation that combines the body, breath and mind in a concise and powerful practice. With the Divine Light Invocation, you visualize Divine Light, recognize the Light within and learn how to share this Light with others. Light is a symbol for God, the Most High, the Divine energy by any name. With sincere practice of the Divine Light Invocation, you can gain a greater understanding of your own divine nature. By encouraging balance in everyday life, the Divine Light Invocation can promote healing – physically, mentally and spiritually. First presented to Swami Radha during her time in India in the 1950s, the Divine Light Invocation has become a pillar of her teachings and an integral practice of Yasodhara Yoga. Mantras are words of power that have been chanted or recited for thousands of years by seekers longing to reach the Divine. In Sanskrit, mantra means “the thought that liberates and protects.” A mantra is a combination of sacred syllables that forms a nucleus of spiritual energy. Mantra Yoga is a tool for the development of an individual, and will help restore energy and aid in healing and relaxation. Concentration is cultivated, which brings a deep sense of peace and joy, as often arises with other forms of meditation. The goal of Mantra Yoga, as with all yogas, is the unity of individual consciousness with Cosmic Consciousness. Simple and prayerful, Sacred Dance is another way to explore the body as a spiritual tool. Swami Radha, a professional dancer, taught a number of prayer dances based on sacred dance traditions from India. These dances are a yogic practice and have form and structure in the same way that asanas have. Each dance is a communication with the Divine. Every dance tells a story and every gesture has meaning. Often set to prayers or mantras, sacred dance is a devotional offering. Through dance, you can embody the Divine within through gestures, rhythms and movements, a precise language that speaks to and awakens your spiritual nature. No dance experience is needed.